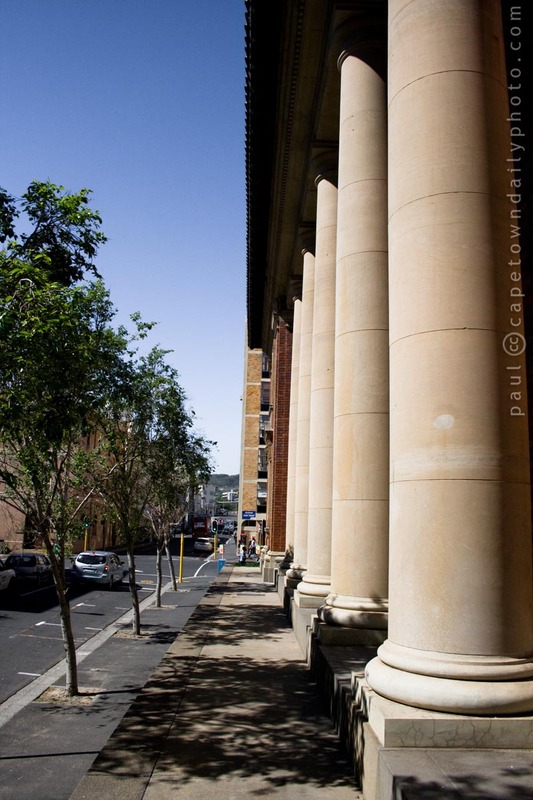 These are the pillars with which the Cape Town Magistrates Courts in Parade Street are built. To be honest, I'm fairly confused by our country's many courts and their legal processes. We have Magistrates Courts, Regional Courts, High Courts, Equality Courts, Supreme Court, Constitutional Court... to name only a few. See the full list of courts here. Perhaps it interests you to know that there are about 366 magisterial districts and main magistrates’ offices - and about 1906 magistrates in South Africa; which I guess is a great number of people who on a daily basis have to make difficult decisions over other peoples lives. I guess then it's not strange that the Department of Justice and Constitutional Development is trying to (or by this time may have) implement an amendment to the Magistrates' Courts act which would make stricter the criteria for appointing magistrates. Basically the draft bill would require candidate magistrates to have a higher qualification than what is currently accepted and in addition specifically details requirements such as "competence, diligence, dignity and social standing". While not being a reflection on our 1906+ magistrates - I can't say that this would be a bad bill to have passed! Posted in General and tagged law on Monday, 13 September, 2010 by Paul.